The new age of marketing opens up new opportunities to reach more targeted customers. With the advent of online video marketing, and explosion of social media, some companies are really seizing marketing 2.0. One of these companies is energy drink maker Red Bull. Red Bull has been able to blend real news, social media, and branding to really gain attention. The company has literally created history, as evidenced by the recent space jump by Felix Baumgartner. Ever since the company’s highly successful canned energy drink was introduced, Red Bull has been keenly aware its target audience is the 16-24 year old age group and has found ways to have them gravitate toward the product. Red Bull’s marketing strategy is the perfect example of how a company – however large or small – can reach a huge consumer base merely by a relentless drive to focus on its target demographic. One of the great things about online advertising is that it makes it easier to identify and locate targeted customers. Red Bull has used both online and offline advertisements as well as its partnerships and sponsoring campaigns to draw attention to the event or product and tie them into its brand. For example, Red Bull is a big sponsor of extreme sports. This is a natural fit for its targeted audience and it has been able to implement a strategic marketing plan in which it gets benefit from the advertising on the many different mediums of marketing. Until recently, print, radio and TV were the dominant forms of advertising. Today, marketers have many more choices and expect much more from their advertising dollars. They want to see tangible results in terms of how the exposure translated into increased sales. Print advertising has declined significantly over the past decade but that doesn’t mean you should shift all your assets to digital mediums. Red Bull is using an old strategy and leveraging it more ways. Although the Red Bull MINI trucks, painted a bright blue and silver, roam the streets just as the Oscar Mayer wiener trucks have done for the past five decades, the advertising specialists are creating a vehicle – literally and figuratively – that sticks its nose into just about everything it possibly can. The trucks are seen at Formula One races, extreme sporting events, parades, or you may just catch one driving down he street. The idea behind the Red Bull MINI truck is to promote an off-the-wall image that attracts the teenage/young adult population. Regardless of what a college kid’s interests are, eventually he or she will be exposed to Red Bull, and by pushing the limits of extreme sports and what is cool, stay top of mind. What makes the Felix Baumgartner space jump so amazing is that it worked on so many different marketing levels. Baumgartner became the first person to break the speed of sound in free fall reaching a speed of over 800 mph in his space jump from 120,000 feet up in the stratosphere. 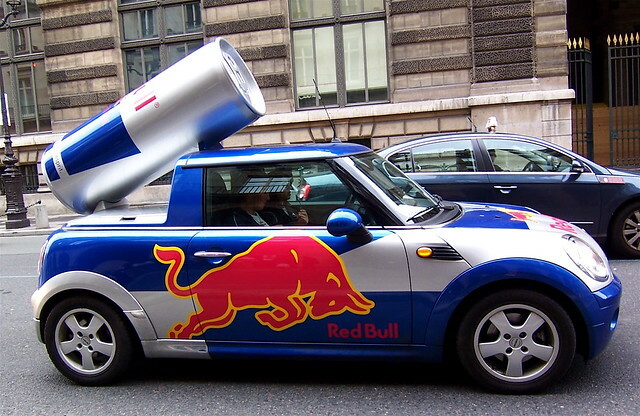 It was the perfect vehicle for Red Bull to grab attention. The exposure for the company nearly doubled overnight. Because Red Bull had already done the smart thing and laid the groundwork for marketing success with videos, articles, and links of every kind via Facebook and other social networking and sharing sites, the exposure for the company was ensured by the millions of users who anticipated the space jump. The company laid the foundation for a successful event that they could use to market their brand and is a good example of strategic, cohesive marketing. Those who visit the Red Bull website will get an immediate idea of how this company chooses to connect with its customers. Instead of a lot of product descriptions or images, Red Bull is all about being cool and providing content its audience will love, and they will associated with its brand identity.